It’s unacceptable to go in for a kiss if you have bad breath. Kissing someone with bad breath brings up to the table too many questions about your health, attitude, and respect. Too many worries for your kissing partner. If you respect your girlfriend, wife, or date, at least a little bit, use a mouth freshener before kissing her. This may avoid the unpleasant consequences, and, instead, leave a good impression of you. Boy! Is that important in a relationship? Mouth fresheners are a great solution to get rid of bad breath fast. Your kissing partner won’t notice how bad it was before kissing you. This allows her to focus on the pleasurable moment of the kiss. Find a list of mouth fresheners grouped in best sugar-free gums, best mouth sprays, and best mints. Below each product review finds a buy button. This SIMPLY GUM gum is the best. I love, love, love maple. It is not made of synthetic ingredients. It is made of 6 natural ingredients. It comes sweetly & thoughtfully wrapped & tied from NYC, with a personal hand-written note enclosed, which is a delight to see. I like that touch. Comes in 6 natural flavors: maple, coffee, ginger, mint, cinnamon, fennel licorice. 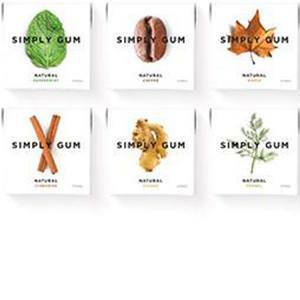 Simply Gum actually pulls ahead of regular gum. Instead of being left with what feels like a lump of tasteless soft plastic in your mouth, you actually have a smooth, natural tasting gum remaining. Trident is sweetened with Xylitol, which provides long-lasting flavor, fights plaque, and restores pH balance in the mouth. Trident’s Unwrapped’s unique container is office and travel-friendly. Great deal! Love that they don't have the sugary coating. I go through about 1 container in a month. These stay fresh in your mouth for a fairly long time. 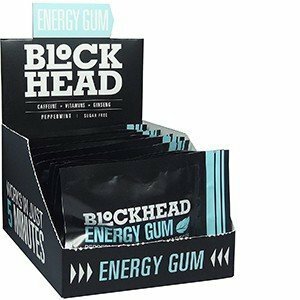 Blockhead Peppermint Energy Gum is a fast and easy way to get an energy boost. It’s like getting an espresso without sugar and calories. Contains 50m of caffeine and B vitamins (B1, B6 & B12) and ginseng, for sustained energy metabolism. Fresh minty flavor, sugar-free, zero calories, aspartame free, and vegan-friendly. 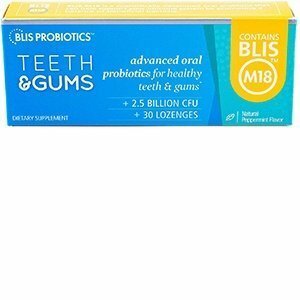 Contains bliss M18 – the newest of advanced oral probiotics available on the market. It is scientifically developed oral probiotic to support oral health and maintain the bacteria balance in the mouth. This is the highest dosage I could find, and this probiotic really works. Along with a comprehensive oral hygiene practice, this populates the mouth with highly beneficial bacteria that keeps my breath fresh all day. I always dissolve one in my mouth before bed and wake up with sweet breath. It’s amazing. Contains Xylitol, which is an all-natural sweetener found in many fruits and vegetables. No sugar, no aspartame, and no icky chemical concoctions. We absolutely love this gum! The flavor is great! Reminds me of Juicy Fruit gum. Plus it has the great benefits of xylitol. Leaves your mouth feeling clean and not waxy like some gums. Another bonus is it has the most xylitol out there with 1 gram per piece of gum. We've been using this along with Squigle paste to improve our overall mouth health, and we've had some great feedback from our dentists! 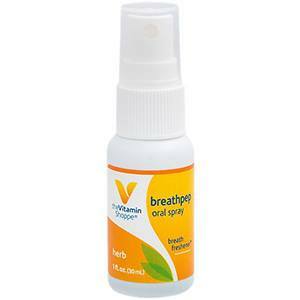 Prevents mouth dryness: the mouth spray contains tea tree oil and aloe vera which hydrates and nourishes your mouth. Contains organic peppermint and colorless coconut activated charcoal that cleans the mouth and fights bad breath instantly. I really enjoyed this product. I have used it in the mornings after my coffee and it really takes away the coffee breath, which I don’t need to have while I’m at work! I also hate onions and my husband loves them, so I started using the spray on him to counteract his “onion breath,” it really works! The flavor is great too, very light mint flavor and not overwhelming. The mint flavor of some of these sprays take your breath away but this spray is just enough and works wonders for rotten breath! Will definitely purchase again! I use a CPAP machine and dry mouth is a consistent issue. 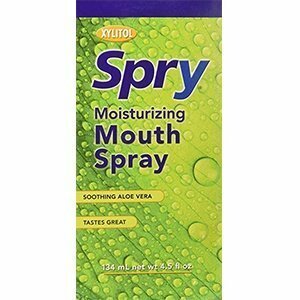 I've tried a couple of different sprays for dry mouth and this is the best I've come across. The taste is definitely better (no funny aftertaste) and it seems a shade more effective than others. I also like the fact that you get a good sized bottle and a travel spray as well. I thought about giving it a four, because who loves mouth spray? But it gets a five because I'm very happy with this purchase and the results. Would buy again. Loving this. I’ve had dry mouth for years now but I’ve never tried a product that was so helpful and at the same time enjoyable. I like having the travel size along with the regular size too. 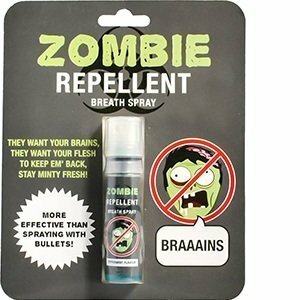 The Zombie Repellent novelty breath spray makes a great funny gift. 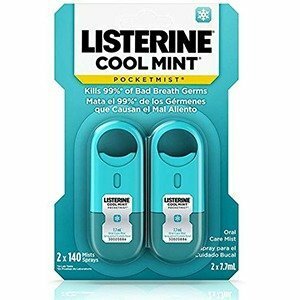 Kills the bacteria that causes bad breath and freshens breath in seconds. Vegan, gluten-free, alcohol-free, and sugar-free. Made with Xylitol natural sweetener. Convenient 30 ml bottle that fits in your pocket or purse wherever you go. 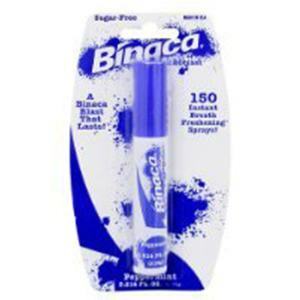 The best mouth spray I've ever used very refreshing and the taste is great with watermelon and mint flavor. And since it's dentist formulated it works very well especially its natural and kills bacteria in the throat where they hide and multiply. The nozzle is very convenient. It helped me a lot with my scratchy throat from my post nasal drip due to sinus allergies and healed my mouth ulcers. My breath is so much better now since I started using Ahhmazin Breath. I recommend this mouth spray to everyone. The bottle is easily portable and contains over 100 sprays. Ingredients: Parsley root and peppermint oil. Over 100 mints in each pouch. This is THE product for which I've been searching! A no sweetener, minimal ingredient, natural breath freshener. I cannot thank Root Chews enough! This summer I gave up sugar and sweeteners and had to say goodbye to my gum. (I was a gum addict.) For months I've been searching for a truly sweetener-free alternative and it seemed to just not exist. 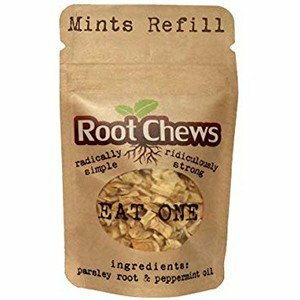 Then last week I found Root Chews while searching the internet. They are not "chewy" like gum, but they pack a punch like an Altoid and I have confidence that my breath is fresh. And the cute little package fits right in a pocket or purse. Love, love, love it! Box of 24 tins, 80-100 mints per tin. 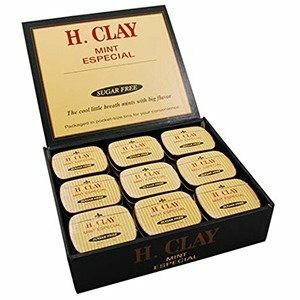 I smoke an occasional cigar (2-3 times a month) and keep these in my pocket to kill that awful cigar mouth, these are very powerful and a perfect size between Altoids regular and small unlike Altoids these have a smoother mouthfeel. The price of the product is amazing. Ingredients: xylitol, maize dextrin (fiber), natural spearmint flavoring. The mints are safe for anyone with allergies or dietary restrictions. Contains 12 pouches with 20 pieces each (240 pieces total). Husband's favorite flavor of mints. 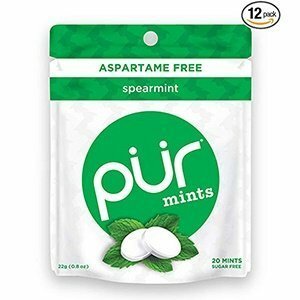 Pur brand does not contain aspartame or sucralose. Xylitol is the sweetener and is supposed to be good for your teeth and gums. He really likes the orange flavor. We order the peppermint and other mint flavors too. The pouches are easy to carry in the car or purse. 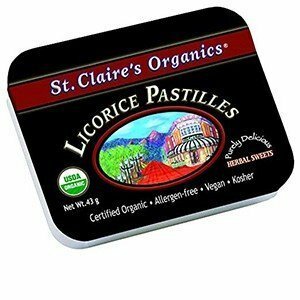 A delicious organic, allergen-free breath mint. Certified organic, GMO-free, Kosher, Vegan, Fat-free, Low-glycemic. Love this company!! I have tried the Licorice, Peppermint, and Spearmint. I have been very happy with all my purchases. Love that they are organic. I use these for digestive issues (stomach upset, gas and bloating). Peppermint has become my best friend for ulcer pain. The texture may take a little getting used to but for me, I have no problems with it and am pleased to recommend. Kills 99% of bad breath bacteria. Having one of these on my key chain is my secret to confidence in any situation. Interviews? No problem. Auditions? No problem. Happy Hours after work? No problem. 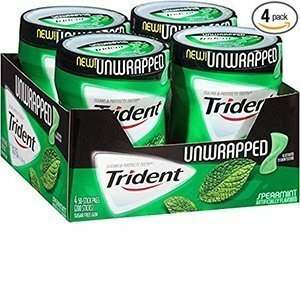 I never, ever have to worry about bad breath anxiety because these are handy, work GREAT and don't taste half bad either. Highly recommend.